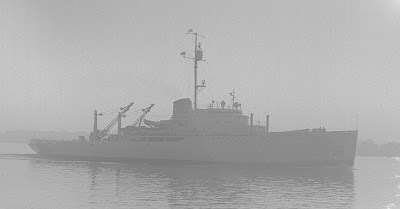 Thanks to MikeM for identifying the ship as the United States Coast Guard Cutter Mackinaw. The ship was launched in 1944 and decommissioned in 2006. The ship is now a maritime museum. Looks like the Coast Guard cutter Mackinaw in its original paint scheme.